Through the Internet, we have discovered Ballycassidy in County Fermanagh, which, according to Cassidy Clan Chieftain Sean Cassidy, is where the Cassidy name started. Apparently, our Cassidys left County Fermanagh and settled in the neighboring County of Donegal. My father, Frank, was born in Leghowney and my mother, Eileen, was born in Aughlem. Both places are tiny sections of Donegal just outside of Donegal Town. 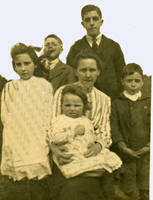 We know that the farm my father was born on was inherited by his mother, Bridget Murphy. And it appears that the farm was in her family for a long time before that. My mother’s grandmother, Sally Freel, also inherited her family farm that was purchased with money from the San Francisco Gold Rush of 1849. After making their fortune in California, the Freels went to live in New York. But they thought New York was too tough a place to be raising Sally, their youngest, so they went back to Donegal. They left their sons, who were grown up by then, in New York but no one knows what happened to them. Sally married Francis Cassidy, who was much older than she was, and they lived on the farm in Aughlem.